Join us in Brookfield for an exclusive, winemaker dinner. 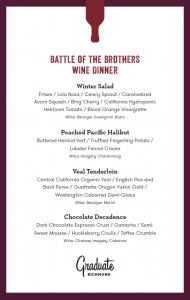 David Merfeld, winemaker from Northstar Winery in Washington, will be joining us for this four course, wine-paired dinner. Full menu to be released shortly. Dinner starts promptly at 6:30. Complimentary valet parking available. 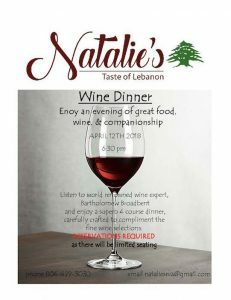 Join us at Natalie’s Taste of Lebanon on Thursday, April 12th at 6:30 pm for our Wine Dinner! For $65 per person, enjoy an evening of great food and wine as you listen to world renowned wine expert, Bartholomew Broadbent. A superb four course dinner has been carefully crafted to compliment the fine wine selections. Make sure to make a reservation, as there will be limited seating. Call us at 804-499-3030 to book your seats now or click here to purchase tickets online! Join us for our dinner series, featuring a different, locally-sourced, four-course menu and drink pairing each month. Space is limited, so please RSVP via Eventbrite by February 20. Please feel free to take advantage of our complimentary valet parking for this event. We will see you there!